The day had begun almost calmly with just the constant tick, tick, tick of the counter as a regular stream of Sharp-shinned Hawks and the odd Kestrel jumped off of the West Spit and disappeared literally and figuratively into the haze of the lake beyond. This stream is nothing to panic the remotely seasoned watcher by any means, and the flow is light enough to allow a little time to scrutinize and even appreciate the passing flocks of blackbirds. Here and there, groups of Rustys stream by with their Red-winged brethren, belying the rather depressingly diminishing numbers across the continent. As the gloom and haze lift from the sky, letting in shafts of light and the ensuing heat, the sky becomes at first patchy and then breaks open into a rather beautiful spring day. To the delight of those watching below though the dreaded “Broad-winged Blue” or “Blue sky of death”, that renders hawks almost invisible in its cerulean cloak, never quite materializes. Rather, thankfully, a thin gauze of cirrus stretches across the sky and here and there globules of passing cumulus act as a backdrop to highlight the rivulet of passing birds. With the rising heat, a corresponding rising of the birds begins to occur, and before long the small and scattered kettles of Broadies become a high and steady torrent of pepper spot birds that surge meaningfully across the sky, driven on by a craven desire to get north to breed. A scan of the sky reveals two thousand in a constant surge here, and three thousand more over there. If you are lucky they stop intermittently to kettle for a while and perhaps drift back over the platform to put on a show for those merely observing below. This drift might also help you catch the tail end of a missed source, but equally may just help to confuse the issue. The clipped response a mixture of inquisitiveness and disbelief. 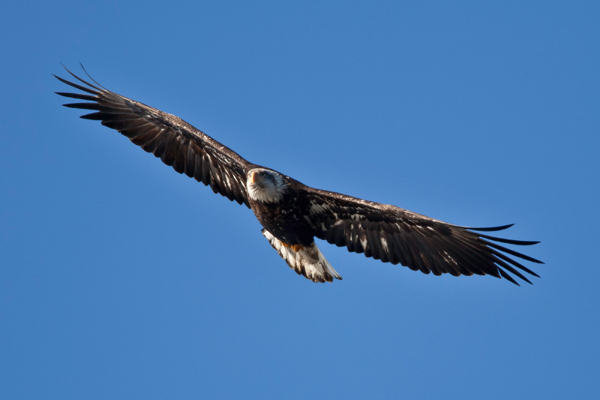 With soaring birds and numbers, the panic is setting in. A counter is quickly proffered to another helping hand (the Sharpies over the bay) and a pen and pad farmed out to another in order to scribe the incidentals: a Red-tailed here, a surge of harriers there and then a stream of Broad-wings that contains eight Bald Eagles, a conservation success story writ large across the cobalt blue April sky. A stream that contains perhaps more eagles than the first counter at this site might dared have dreamed of seeing in a season let alone in this one singular hour. Proof positive that in conservation that sometimes, just sometimes, (yet depressingly all too scarcely) where there is a will there is a way. The hawkwatcher with his puny vision can only hope to replicate the acuity of the visually enhanced hunters in the sky through the aid of trusted Swarovski, Zeiss or Nikon. Amazing to consider that these birds view of you and your little platform is almost exactly the same as yours is of them, and yet you have clasped to your face a thousand dollars or two of finely crafted and engineered visual aids. Do they see you, and watch you back you wonder? And if so do they care? A hawkwatchers joke that maybe equally they are ticking off hawkwatches on their journey north across the continent! You however are becoming rapidly smaller as they ascend to what must be maximum soaring height. “No numbers please” you urge as you try to keep grasp of the numerals that are now spinning rapidly through your head and off onto the counter affixed to your hand. Clicking off the Broad-wings in at least 10’s by now. Amusing to reflect on that first singular Broad-winged that rose above the horizon six or seven hours ago, giving prolonged scope views as she lazed listlessly up into the ether above, you little realizing then that she had brought nearly 40,000 of her friends with her. 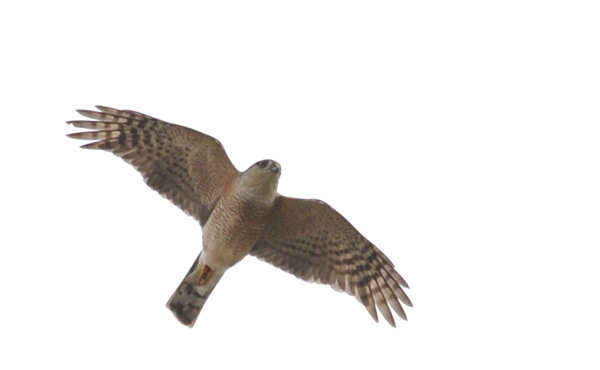 Before the buteo show had begun, accipiters seared across the bruised sky of the bay. 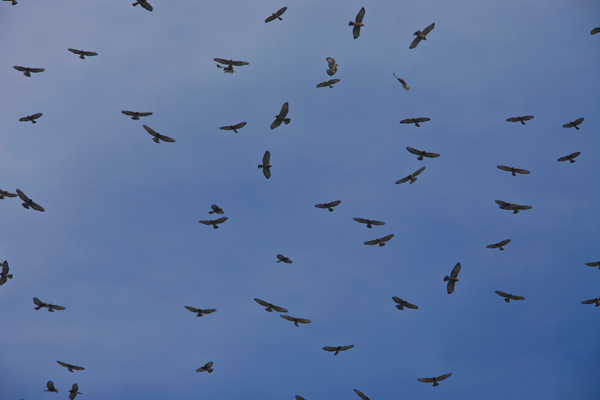 These harbingers of winged death, all glinting eyes and flashing talons that promise a swift death to the swirling mass of thousands of passing passerines: mere “hawk food” to the more dismissive raptor jocks. Many of these accipiters cruise past, crops bulging, the thousands of miles traveled by those five inch long, warbler shaped, miracles of migration ended in a panicked chase across the scattered trees of the West Spit of Braddock Bay. Just to keep you on your toes and apropos of nothing, the Broad-wings suddenly splinter across the sky, drifting in across the streets of Hilton Village, an invisible and imperceptible lake breeze effect kicking in. But there is no lake breeze today, so what is causing this frustrating and confusing break up of your line? Something that the birds have perhaps picked up that is impossible for a mere human, or even a mere humans little portable Kestrel weather station, to identify. Then the cause of the birds break up looms across the horizon, a closing line of cloud threatening rain and quite possibly something more destructive – a tornado? The stream of birds peters out and then dies. The numbers written down just raw figures for now, but already contained on the scrawled data sheets the secret that a record has been broken for Braddock Bay, New York State and perhaps beyond. No time for celebration now though, just the ache of joints inflamed by hours spent on ones feet, the dull throb of reddening skin that carelessly slathered sunscreen had failed to cover and the carpal tunnel pulse of the counters that have been glued to hand for the last ten hours! As you turn to leave, the sky now foreboding and dark closes in behind you sealing the flight firmly closed for the day. It will be opening again early tomorrow to let those stragglers through. But for now beers and beds are calling! Thanks to Steve Beal for the kettle and Bald Eagle Shots, you can check out more of his pictures on his photography blog (click here). Thanks also to Josh ‘Livin’ the dream’ Lawry for the accipiter shot. If you want to check out the day in simple numbers you can visit hawkcount.org (here). The day surpassed the previous biggest day in Braddock Bay history (27th April 1987) and probably accounts for the biggest flight day recorded in both NY State for both raptors generally (42,235) and Broad-winged Hawks (39,417) in particular. Doing a little rudimentary research it seems like this could be one of the biggest spring flight days recorded in Canada or the USA? Congratulations on a great day! I have checked our records in HawkCount.org and found no other day that rivals this during spring. As you are aware, some autumn Great Lakes and Texas sites have recorded impressive numbers of them, but as I said above, nothing like this in spring for any site in the United States or Canada. Thanks for the congratulations and for the added information. I have heard rumors of big fall flights from other hawkwatchers I know but as you say no one could remember anything to quite compare in spring. All I can say was it was a real privilege to be here for such an incredible day! The spring counts in Corpus Christi have been sporadic and, to my knowledge, never sent to HMANA or HWI, even though there have been 100k+ days. Luke – congrats on beating the 1987 – we were banding our ASSES off that day, as the accips were coming in below the BWs, and the hawk lures got a workout. If I remember correctly, only a few days later Nicolletti, Mather and one other person saw the ultimate raptor pairing in the same calendar day – Snowy Owl (morning) and Mississippi Kite (afternoon)!